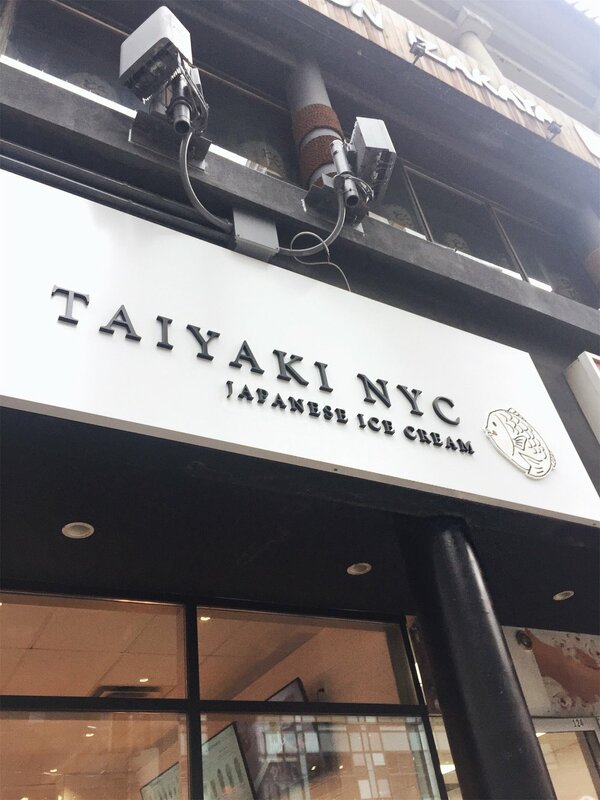 Taiyaki NYC is a very famous ice-cream shop originally from New York. 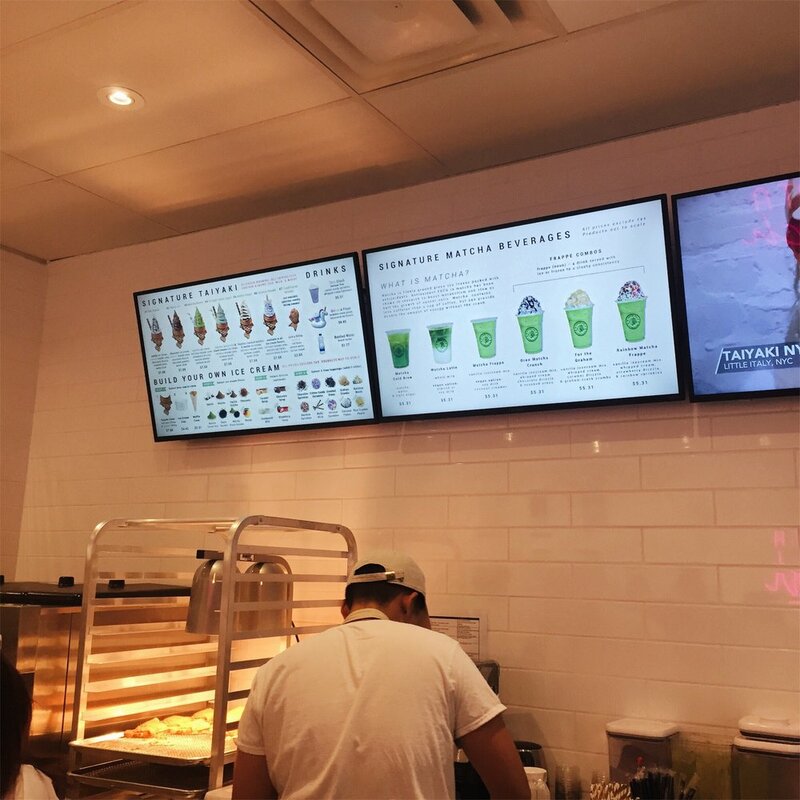 Toronto officially has one located at 128 Dundas Street West! It’s quite close to the Eaton Centre. Whoop Whoop! So, what is Taiyaki? Taiyaki is a Japanese cake in the shape of a fish. I say cake but it’s kind of like a waffle. It usually has a filling such as red bean, custard or even cheese but it can have other fillings too. I have only ever tried it with red bean filling or custard. Taiyaki NYC sells Taiyaki with the filling but it’s shaped like a fish with its ‘mouth open’. This way the Taiyaki acts as a cone for scoops of ice-cream which you can add toppings to. It’s awesome. I don’t how else to describe it. I have had store bought Taiyaki from places like H Mart but Taiyaki from Taiyaki NYC is in my opinion, the best in the city of Toronto. When you’re eating it, the transition from the cold soft serve ice-cream to the warm Taiyai filled with a warm filling is just so amazing and delicious. 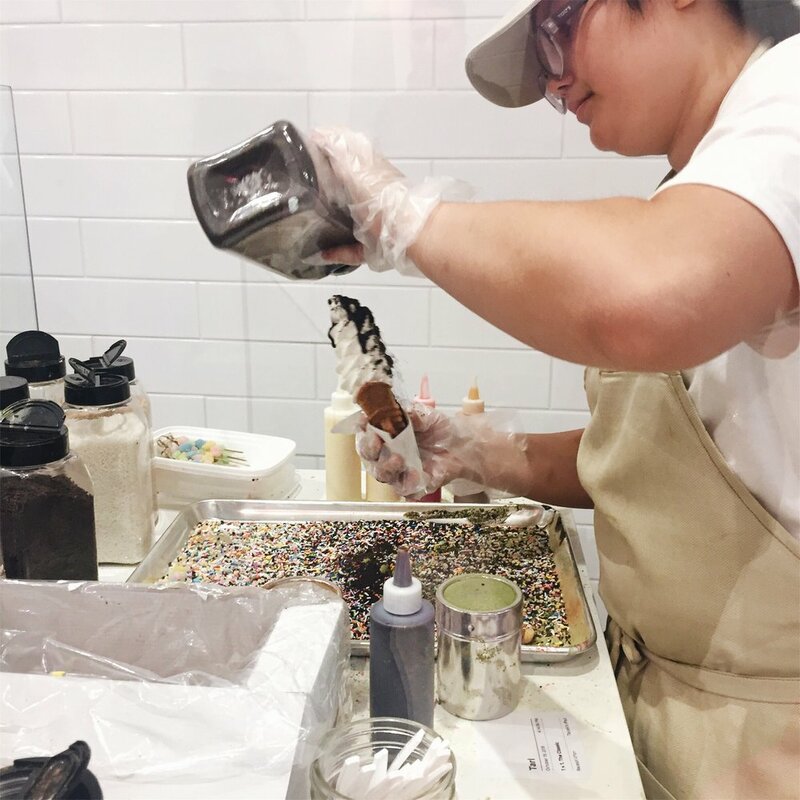 The cones are baked fresh from a batter in front of you in the shop. You get to watch the whole process of them making it. 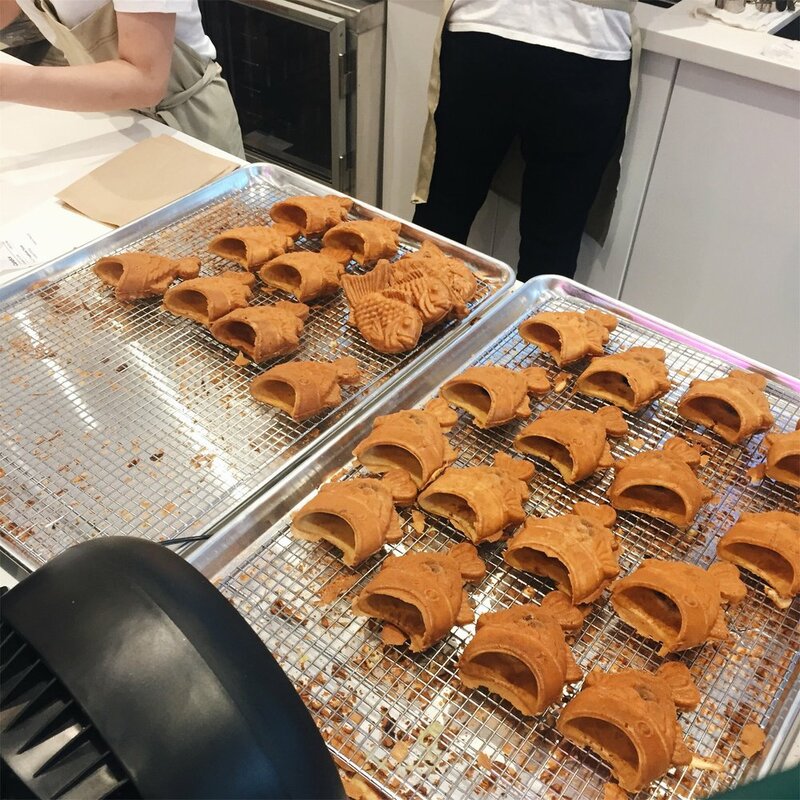 You see them pour the batter into the Taiyaki moulds, add the filling and you see them scoop ice cream into it and then add the toppings. I also want to mention that the people who work there are quite friendly. I’ve been a few times… okay fine, I go OFTEN. Ha-ha. Each time I’ve been the customer service was quite good. There isn’t much seating inside. That’s probably because most people get their Taiyaki, take photos in the shop (because it’s super instagrammable) and then eat it on the go. There are a few stools to sit on by the high tables. There are plenty of tissues too. Taiyaki ice-cream can get a bit messy if you take too long to eat it (cause you’re taking photos forever) and let it melt. That or you’re super clumsy like me. I have actually seen people knock their Taiyaki over and drop the entire thing on the floor before eating it. It always happens in slow motion for some reason. Thankfully the Taiyaki NYC workers are super nice and have made them again for customers. Be careful with it! I mentioned that the shop is super Instagrammable right? 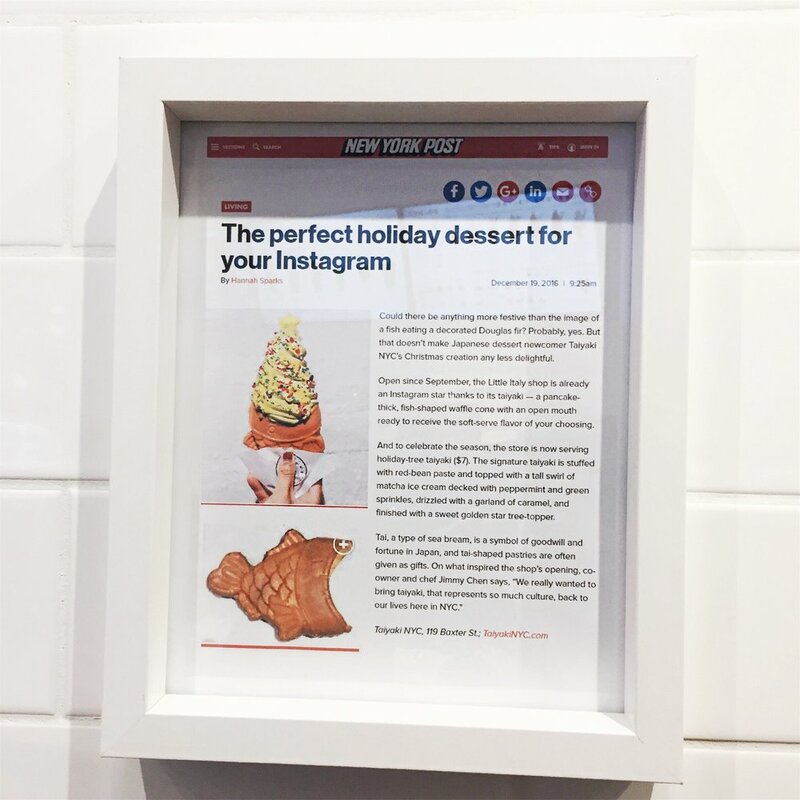 Well, Taiyaki NYC is famous in a way because they’re so instagrammable. Search #taiyakinyc on Instagram and you’ll see what I mean. I’m glad they’ve brought that ‘instagrammable-ness’ to their Toronto shop. 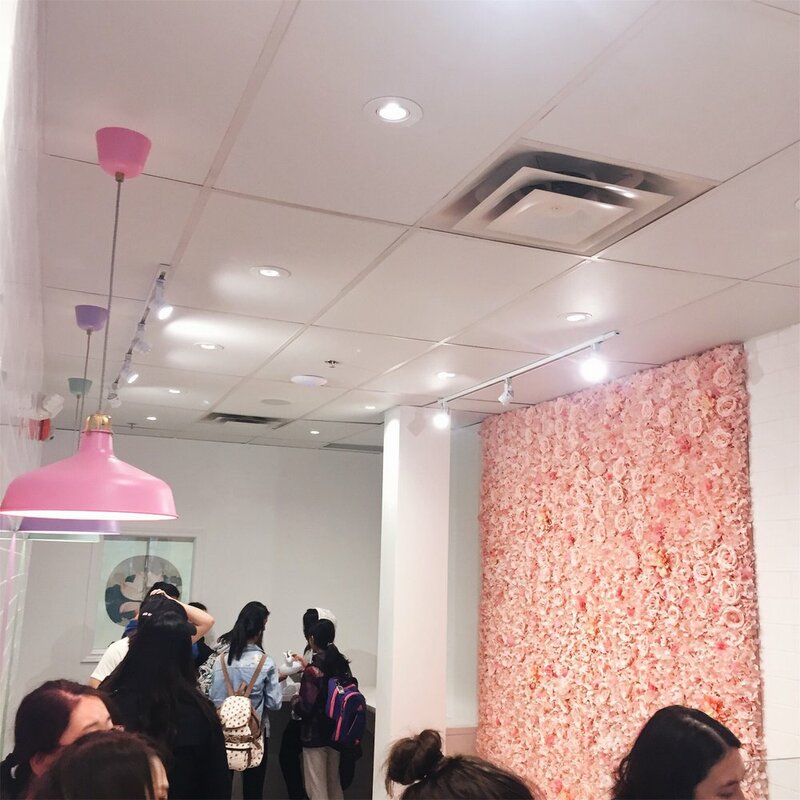 The Toronto location has a beautiful pink wall of flowers. On the other side, you have a tiled wall with triangles of colour and a lamp above the triangle to give you some artificial lighting that helps make your photo look well-lit. Here is their wall of framed articles written about them by famous news and media outlets. I love Taiyaki NYC. I hope you get a chance to go if you’re in Toronto. They also have locations in Brooklyn and Manhattan NY, as well as Miami, FL. If you get a chance to go, do it.